The SWEAT.SAVER is an anti-sweat heater controller designed to dramatically reduce the cost of operating low temperature glass door cases. The SWEAT.SAVER is a stand-alone unit that uses solid state relay technology to quietly modulate the door heaters at their most energy efficient rate. Anti-sweat heaters typically operate 24 hours per day at full load regardless of store conditions. 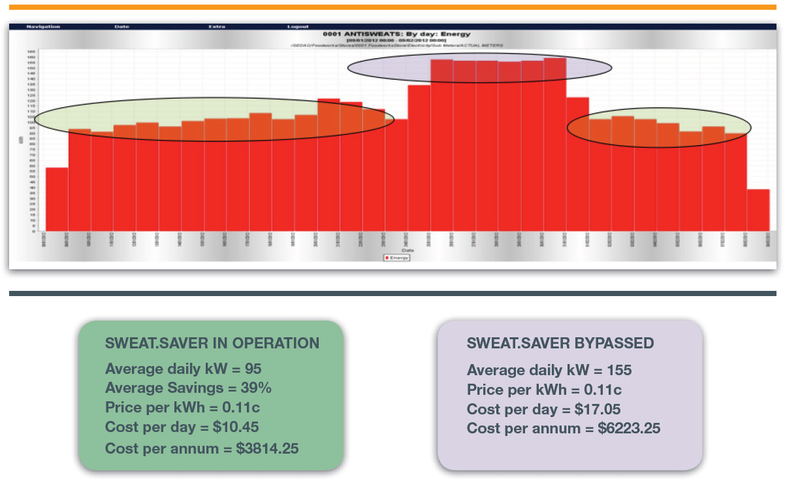 By monitoring the dewpoint of the store, the SWEAT.SAVER is able to pulse these heaters every second. Solid state relays make this rapid pulsing of the heaters possible. The lower the dewpoint, the greater the energy savings. The SWEAT.SAVER is capable of pulsing up to 24 anti-sweat circuits with a maximum of 25 amps per channel. The “no programming” setup allows for easy installation and service. Simply set the pulse rate and dewpoint setpoints and the SWEAT.SAVER is ready to operate.